THE 7th VOYAGE OF SINBAD, 1958. Original Half Sheet (22” x 28” / 72 x 92 cm) folded movie poster starring Kerwin Mathews, Kathryn Grant and Richard Eyer. Directed by Nathan Juan and produced by Charles H. Schneer. Visual Effects created by Ray Harryhausen. “Adventure of the ages- for all ages”. 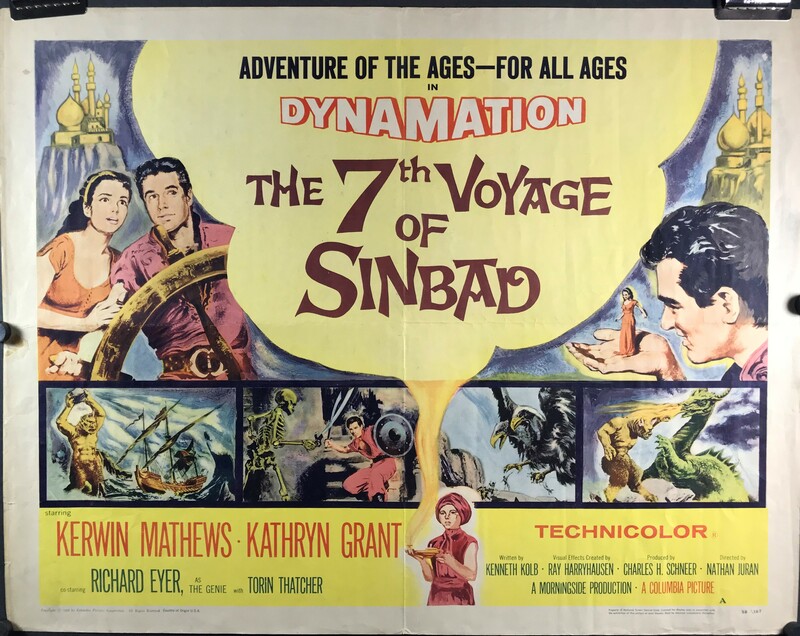 The first of three Sinbad feature films, this film focuses on Sinbad’s quest to a monster filled island to save his princess fiancé from an evil magician. Ray Harryhausen conceptualized all three films of the Sinbad trilogy, and used a stop-motion technique he developed called “Dynamation”. The full color, widescreen, animation sequences in the film were the first to be labeled under the name and took him 11 months to complete. In 2008, the film was selected by the Library of Congress for preservation in the U.S. National Film Registry o be preserved for all time.